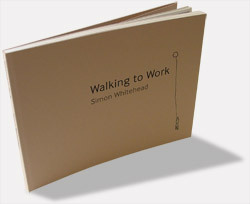 Walking to Work is an anthology of writing, photographs, drawings, sound and artefacts relating to the work of movement artist Simon Whitehead. Drawn from a body of work made between 1993 and 2006 the book reveals Whitehead’s place-sensitive approach to performance making and the collaborative nature of the enquiries he makes with other artists, writers, the public and animals. With contributions by Wallace Heim, Barnaby Oliver, Heike Roms, David Williams and others. The publication also includes 23 medium format colour photographs of project artefacts by Phillip Martin. The book also includes a sound piece on CD: Dulais, made to accompany the publication. The CD constitutes two pieces, Wade and Duck both recorded by Whitehead in Spring 2006 as live compositions on the Afon Dulais river, close to his home in West Wales. The mix and final treatments are made by sound artist and long time collaborator Barnaby Oliver. Working closely with Simon, we were involved at all stages of the production of the book, helping to develop an approach to the different project materials and a structure within which the various strands of Simon’s practice could sit. During the production phase of the publication, we worked closely with both Simon and Phil Martin, a Wales-based photographer whom we had commissioned to photograph the project artefacts in situ in west Wales. We also liaised closely with Spectrum in Cardiff, identifying suitable paper stocks for the different sections and sourcing a robust but elegant solution for the CD, which was to be mounted on the inside back cover.